Any Lady Riders in Alabama? I'm beginning to think I am the only one here. I have advertised to try to find someone to ride with but no responses, not one! I would love to find someone to ride with, so let me hear from you if you want to ride. Comments for Any Lady Riders in Alabama? 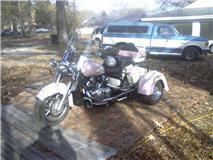 living in the Foley area....love to ride, I ride my own. I am in Alabaster and ride. We are out here. There is a ladies Rider Club out of Pelham. Dixie Diva's. Check them out. May I ask where u r in Alabama?